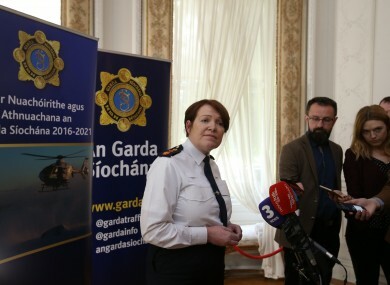 GARDA COMMISSIONER NÓIRÍN O’Sullivan has said that a criminal investigation into the actions of senior gardaí at Templemore is possible. She said that financial irregularities were legacy issues but could form the basis of a serious investigation into what happened at the Garda College. She added that the matters dated back 30 years and that she only became aware of them in 2015. The financial irregularities include a fund that was used for gifts and entertainment, rent collected for a site that should have been paid to the Office of Public Works and the transfer of money to the Garda Boat Club. Assistant Commissioner John O’Driscoll will now examine a report conducted by the force’s head of audit, Niall Kelly, and will make recommendations including whether or not an official criminal probe into activities of senior gardaí at Templemore should begin. I have an Assistant Commissioner examining the report to see if there are any issues from civil, criminal or administrative law perspectives arising from it. He will make recommendations and they will be fully addressed. O’Sullivan also stressed that “under no circumstances” did she mislead a Dáil committee yesterday. Sinn Féín’s deputy leader Mary Lou McDonald claimed the Commissioner’s contributions to the Public Accounts Committee (PAC) yesterday were full of “discrepancies, evasion and delay”. We will find out what happened and who knew about it. We have to make sure there are standards in place. Commissioner at the Public Accounts Committee yesterday. In the more than five-hour hearing yesterday, the Commissioner told politicians that she first became aware of the extent of the issues when she received a report with recommendations from her head of legal affairs on 28 July 2015. An odd exchange between O’Sullivan and director of Garda HR John Barrett then developed over the length of time the Commissioner had spent with Barrett discussing the money issues. Prior to that, on 27 July there was a very brief conversation in a room after meeting in Templemore in which Mr Barrett raised issues around work he was doing. “The meeting was over two hours – it’s in the minutes,” Barrett interjected. He had become aware of audits from 2008 and 2010 that identified accounting irregularities, and flagged them with his chief administrative officer. He had then compiled a report bringing the contents of these two audits together. “My memory is that it was a brief meeting,” the Commissioner commented, in response to his contradiction. Email “There could be criminal probe into Templemore funds - Commissioner ”. Feedback on “There could be criminal probe into Templemore funds - Commissioner ”.